This trendy after work venue sets the pace with funky tunes and flowing cocktails mixed with modern South African tapas. The décor is slick, fresh and office like. 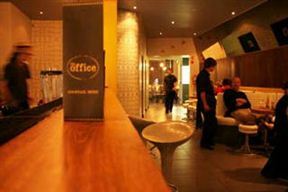 White leather booths, custom made bar stools, wooden tables and old office memorabilia adorn the walls. The menu caters for easy palates and offers delights such as wickedly spicy Thai red curry, slow roasted pork belly with fennel seeds, salt and pepper squid, and pan roasted Portobellini mushrooms with sherry vinegar and Manchego cheese. Desserts tempt with baked hot chocolate pudding and maple walnut crème brulee. 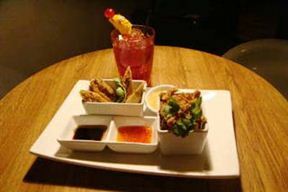 Enjoy delicious food and mouth watering cocktails at this cool and trendy after-work venue in Greenside. The Office is 1km from the centre of Greenside , the nearest airport 24.5km (Johannesburg International Airport).